Live online multiplayer • Achievements • Statistics • Game options • Smart AI opponents • Frequent updates • Lots of happy players • Play Spades now! 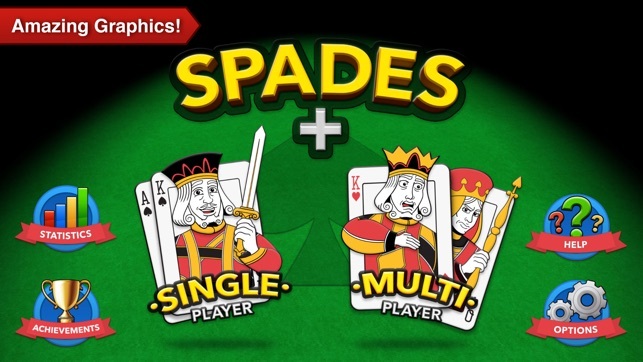 Spades+ is the premier free Spades card game for iPhone and iPad! Spades+ has been in development for years by a dedicated team and has seen countless new features, improvements, and bug fixes. It's fast, stable, always improving, and, above all, fun! 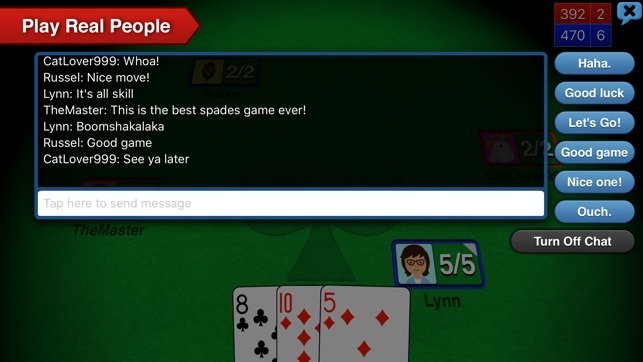 * Play Spades online with your friends and everyone else! * Achievements, some easy, some hard, can you get them all? ***** "Superb! Very well programmed. Excellent and challenging for every phase of the game!" ***** "Love this game! It's an awesome app!" 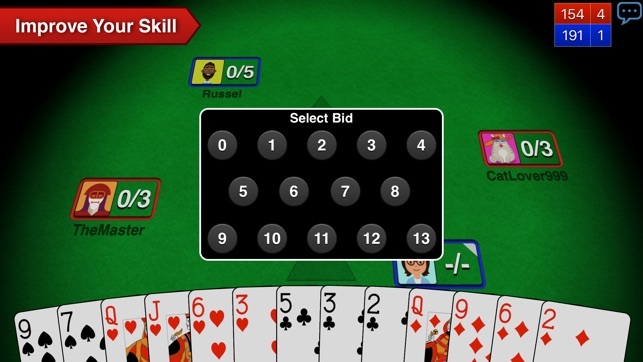 ***** "Best card game interface for iPad. This is a great game that features pleasing high-def graphics that look especially good on the iPad screen. The deal and trick pickup animations enhance the game playing experience. Card games are simple, but they don't have to be dull and this one is fun without resorting to cheesy animated 'characters'..."
***** "Awesome. Love it! stimulating beautiful graphics, challenging. well done." ***** "Great!! I love this game!! I play it all the time! Highly recommend!" 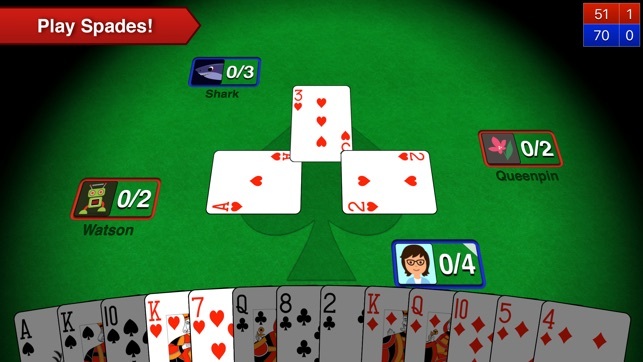 ***** "Downloaded this after I began to teach my kids to play spades for Family Night. Thought it couldn't hurt to brush up my skills! 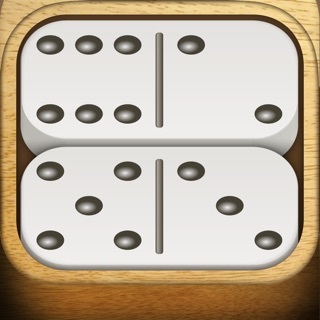 I find myself playing this for hours! Great app." ***** "LOVE THIS GAME! I play everyday!" ***** "Hooked. If you like spades, this is a great game. Plays like the real thing." Amazing. I read several reviews regarding rampant racism and horrible sportsmanship. Thought “these people are just exaggerating” ... turns out they weren’t. First (and last) game I sat down to was unbelievable. Everyone was rushing with chat comments, I mean a constant barrage, not after 5-10 seconds but IMMEDIATELY! My own teammate was overly aggressive on the chat towards me. I’m not crying, I can handle my own in a chat, but it was a shock to be smack talked by one’s own teammate WHILE WINNING. The barrage of hurry-up comments never cease. EVER. What really put the experience over the top was the blatant racist remarks he(?) used in reference to other players, being able to use vile curse words by simply putting a space in the middle (most games will censor anything remotely interpretable as foul language regardless of how cute or clever one gets). This person used the “N” word repeatedly as well as a host of other colorful language, again I’m not crying about MY feelings but the completely inappropriate nature of this person’s comments in the chat. I am uninstalling this game immediately, I recommend that you save yourself the trouble and don’t get it. You WILL encounter racism and poor sportsmanship. Throw The Whole App Away!!!! I downloaded this app less than 24 hours ago and will be uninstalling. My partner and I were winning and there was a racist jerk on the team who became upset he was losing. He than began to tabletalk actually telling his partner what to play and harassing me. I clicked on his profile trying to report the issue and/or block the player and there was not an option to do either. I emailed the developer detailing the experience and suggesting the option be added to the app to report, block players etc. I received a response from the developer whose name is Jason. His response consisted of thanking me for emailing about the AI of the game and that he was sorry I had a bad experience with the "AI". My email had nothing at all to do with the AI of the app. It seems like he just clicked a random auto response and used it to reply to me without even taking the time to read the actual email I sent. I know that developers cannot control actions of other players but they do have control of the level of appreciation(or lack thereof) that they show their supporters. This has been a terrible experience and I refuse to support an app(rather free or not) whose developers show no appreciation or concern for their users. the game itself is great and addicting but it gets very aggravating because the partners in solo mode are absolute idiots. I bid nil and invariable my partner leads a two or four. the opponents bid nil, and my partner plays his highest cards. he plays a higher card or overtrumps my tricks when he plays last and then we don't make our bid because he has used up his good cards to take tricks I would have won. he always plays his highest trump the first chance he gets, even when he is the last player and a low trump would win the trick. doesn't matter if you configure your partner conservative, regular, or aggressive--they don't know how to play the game! UPDATE: This game gets NO stars! Rather than improving the AI partners, they get worse and worse. They have no idea how to bid--often bid 1 with 2-3 aces--and seem to think the goal of the game is to get as many bags as possible. They wait until the other team makes it's bid, then grab as many extra tricks as possible. Can't make it through a whole game without losing at least 100 points for 10 bags. I'm so aggravated by the poor play, this app will be uninstalled as soon as this review appears.